UNIVERSAL COMPATIBILITY – Compatible with two 13″ to 32″ inches screens that weigh up to 19.8 lbs each. 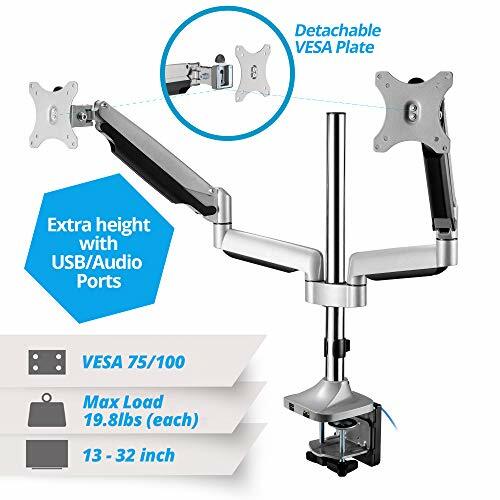 Rotatable and detachable VESA plate patterns with 75x75mm or 100x100mm backside mounting holes support portrait or landscape monitor orientation. Easily create a productive multi-display workspace. EXTRA LONGER POLE FOR EXTRA HEIGHT ADJUSTMENT: Full motions with extra height up to 32.6″, which is 9″ higher than normal dual arms. ±90° tilt, ±90° swivel, ±180° screen rotation, ±180° arm swivel, and ±135° Pan angle to create an ergonomic monitor viewing angle to help reduce eye, back and neck strain. SPACE-SAVING with USB/AUDIO PORTS- Mounting with heavy duty C-Clamp or Grommet Mount makes your screen base out of the desk and gives you a spacious working space. USB and audio ports give you quick access for your USB device and speaker/ microphone. EASY INSTALLATION AND NO CABLE CLUTTER – Removable VESA panel simplifies installation and attachment to monitors. Create a clean, sleek look after setup by concealing cables from sight with included cable management clips. This premium full motion sliding and swivel TV mount extends 28 inches and pivots / swings right or left for optimal viewing. The 28 inch extending arm will allow a 55″ tv to pivot a full 90 degrees without hitting wall. Great for us as a corner tv mount or for centering on the wall between studs. 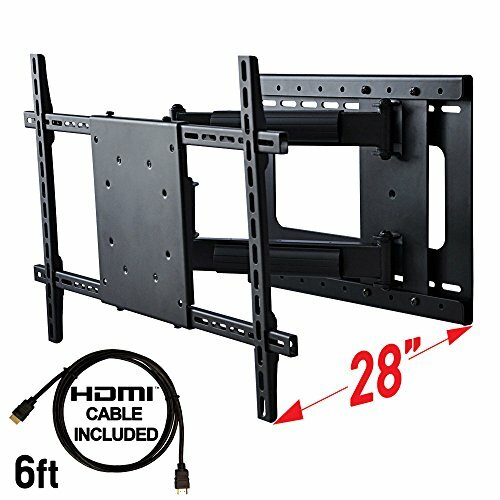 The most unique feature of this mount is the right to left adjustment capability.. Maybe you don’t like the position of your TV on the wall ? Simply move the sliding arm left or right on the wall bracket up to 14 inches. Voila ! Now it is perfectly centered on your wall and or perfectly positioned in the corner. Movement is easy with this Swivel TV Mount, simply push or pull your TV to the desired location, and it will move easily and freely, no tools required. With up to 180 degrees of free movement, your TV can be viewed from any angle. The post installation leveling feature will insure you have a perfect installation every time; even if you mounted it crooked on the wall. Easy to use built in cable management is included for a clean look and will prevent pinching / breaking of your audio video and power cables. Fits all Plasma, LCD, and LED TVs with a mounting hole pattern (VESA) between 200x200mm to 600x400mm. This means it can fit TV’s from 32 all the way up to 60 inches in size. Please confirm for your television’s mounting hole pattern or VESA SIZE. – Includes all hardware for installation to wood stud or concrete wall. Full motion arm extends 28 inches away from the wall yet retracts to a slim 3.0 inch profile. With a 26 inch extension and a single pivoting point you can swivel a 50 inch 90 degrees in either direction without hitting the wall. Great for when the placement of your studs is not in the center of the location of where you want your TV to be placed on the wall. Also great for getting a perfectly placed arm horizontally closer to the corner of the wall or farther away. Included HDMI Cable in the box. This mount passed a safety bearing 500 pounds without failure. So you can be insured that it will safely hold your TV for a long time to come even without sagging or deflection. The extra duty metal and swivel joints insure easy movement of the arms for the life of the mount. Other mounts tend to deflect overtime and cause deflection and difficult movements over time. Post installation leveling allows you to adjust / level this mount after it is installed. Simply pivot the TV while it is still mounted on the wall to your liking and tighten in place. If you need to install on 24″ wide studs, consider Aeon 40300. This mount (only) installs on two 16 inch on center wood studs, concrete or masonry with the provided hardware. To purchase the larger version of this mount for 24 inch on center studs please consider model: Aeon 40300. This mount is definitely not recommended for installing directly onto drywall. 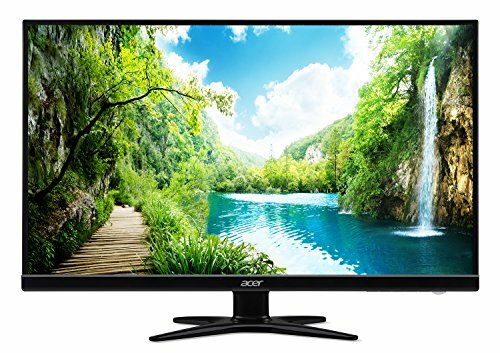 The Acer G276HL Kbmidx 27″ Widescreen LCD with LED-backlit display combines stylish ultra-thin functionality with amazing 1920 x 1080 resolution, allowing you to enjoy High-Definition entertainment in the comfort of your home. Incredible 100,000,000:1 contrast ratio and rapid 4ms response time highlight the advanced technology, but this display is earth-friendly as well. The G276HL Kbmidx LCD also features HDMI, DVI & VGA ports for greater compatibility, a Kensington lock slot to protect your investment, and Energy Star compliance to help you save money and energy. (UM.HG6AA.K03).